During the campaign in Zagreb in the next two months the jumbo posters will be posted which will promote the products not tested on animals. Some well-known public people joined this campaign: Andja Maric, Tanja Tusek, Marija Strajh, Sanja Plepelic, Blazenka Leib, Jasmina Hdagha. With their appearance on billboards and in the media they help the whole campaign. Along with the media support of the high-circulation magazines nad the appearance of jumbo-panoes, we started making up the list of companies which produce cosmetics and cleaning prioducts without animal testing. 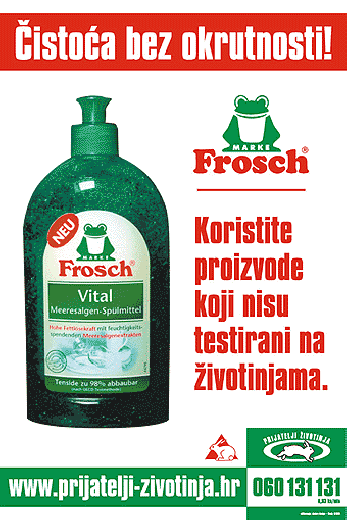 On April 24, Laboratory Animals Protection Day, a stall will be installed on the Svacic Sqaure where people will be able to get the information about testing on animals as well as about the companies which do not test their products on animal such as Avon, Frosch, or Lush. All the information can be found on the Animal Friends' web site www.prijatelji-zivotinja.hr as well as on the phone number 060 131 131. Every year some 35,000 animals in Europe, and milions animals across the world are put through intensive suffering cause by questionable tests of cosmetic products. The tests are run in secret in numerous private and state laboratories. Information about tests can be found only in proffesional magazines- only the successful ones are being published. The term "vivisection" (from Latin life dissect) is being replaced with some more gentle terms such as "research on the model." Rabbits, guinea-pigs, rats and other small animals are used for testing the security of products; they are being poisened with the cleaning products. The most usual reactions are spasm, vomiting, paralyse, nosebleed, and bleeding from the eyes and mouth. Angora rabbits are used for testing of acids (Draize tests): the acid is poured in their eyes, great pain causes screams, and the results that follow aree bleeding, corroded cornea and blindness. While testing the irrability of the skin the concentrated chemical substance is applied on the animals' shaved back and for couple of days the effect are conducted. The wounds are terrible, the pain is unbearable, while animals are not given any pain-killers. If we care about human health, we have toreplace this brutal and barbarian way with truly proffesional methods without tests on animals. There are several hundred cosmetic manufacturers in the world which do not test their products on animals. These manufacturers have totake ull legal responsibility for any damage their clients might suffer. They therefore provide comprehensive information which is possible only without using animals. Companies that do not test their products on animals are more and more replacing the companies that do not want to take full responsibility for the quality of their products and inflict great suffering on animals.